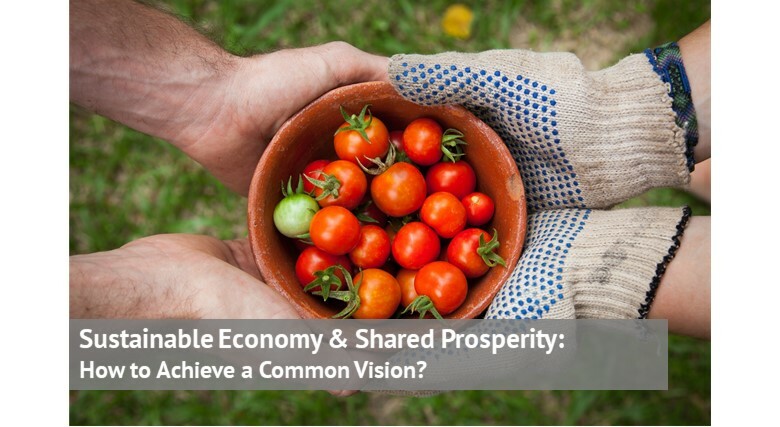 Sustainable Economy & Shared Prosperity: How to Achieve a Common Vision? It only takes a look back to the period after the WWII for one to realize the world has achieved tremendous economic growth during those five decades after its conclusion. The period after the WWII was directed to economic growth that would lift the world from the consequences of the war destruction. And the period from 1945 to 1973 was the period of economic expansion and the Golden Age of Capitalism indeed. What followed after the 1973-1975 recession was a lower economic growth, but still a considerable one, at least for some countries. The global economic crisis that reached the peak in 2008 was a wake-up call for the world signalling that the economy that is based on growth, environmental destruction and social injustice cannot be a base for a sustainable and prosperous future. Has the current economic model brought prosperity? The world economy has been based on an intensive push for constant growth based on consumption, deregulation of financial system and depletion of limited resources. This model of economy proved to be unstable and unsustainable and has just brought prosperity to a tiny privileged group of people leaving a huge gap between the rich and the poor. According to The World Inequality Report 2018 issued by World Inequality Lab, ’’at the global level, inequality has risen sharply since 1980, despite strong growth in China’’. The model of modern economy has generated such a level of inequality that ’’the top 1% richest individuals in the World captured twice as much growth as the bottom 50% individuals since 1980’’. Moreover, the middle-class incomes in Western countries have been sluggish and stagnant since 1980. If prosperity, which is intrinsically linked with economic growth, has been delivered unequally then we can only conclude that the current economic model has failed us.There is no doubt that the current development models require an overhaul. But what needs to be done? Even though these policies may appear to be a bit idealistic, only a huge shift of the current practices can bring the world back on a right track to achieve what can be a sustainable and prosperous future for all. The words uttered by Barack Obama in 2008 are still relevant today: “I think all of us here today would acknowledge that we’ve lost that sense of shared prosperity.” And if we have any doubts about the changes needed in times of distress and inequality, we should ask ourselves: Can we say that prosperity is real if it is based on overconsumption, depletion of natural resources, degradation of environment and human rights? The response would probably be NO. It’s no easy for the world to turn its back to consumerism and embrace real human values, but it’s not impossible either; and then we may have a chance to achieve collective happiness, shared prosperity and sustainable economy. *This blog post is based on the Prosperity without growth? The transition to a sustainable economy Report, published by the Sustainable Development Commission. I agree to receive the latest news, content & updates from Sustainability Knowledge Group. I am aware that I can withdraw my consent by unsubscribing at any time.